The calculation of square feet, square yards and square inches is among the most common of the math operations you'll use in home building and remodeling. It's also one of the easiest to apply. The equation -- length times width or height times width -- is the same, regardless of the units of measurement. The areas of walls, floors and ceilings can be expressed in any unit; square feet and square yards are the most common in the United States. Flat area is calculated the same, regardless of whether you're doing it in inches, feet or meters. Flat, rectangular surfaces are the easiest to compute. Measure the length and width of the floor in a square or rectangular room, and multiply the figures together to get the floor area in square feet. For example, in a room that is 10 feet wide and 18 feet long, the area would be 10 multiplied by 18 to obtain 180 square feet. If you need the area of the ceiling, and the ceiling is flat and parallel to to the floor, then simplify your life by just computing the floor measurements -- they are the same. To estimate flooring for your entire house, compute the square feet of every room; add them all together, and add 10 percent to cover wasted materials. Wall area is used to estimate wall materials, such as paneling or drywall, and wall coverings, such as paint and wallpaper. 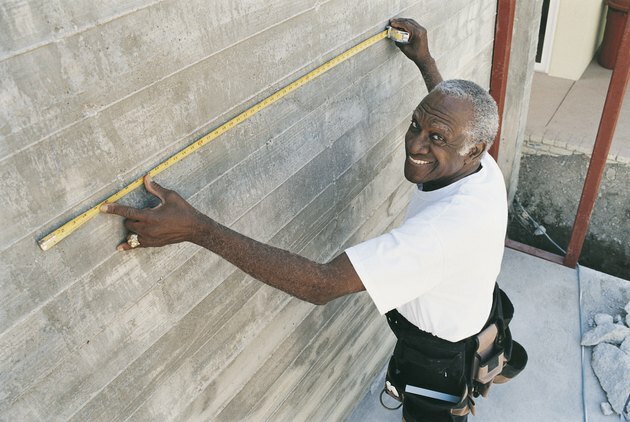 Measure the wall from ceiling to floor and from end to end, and multiply the result. If the 18-foot-long room measures 9 feet from floor to ceiling, then 18 times 9 is 162 square feet. The adjacent wall, if 10 feet wide, would be another 90 square feet. Add together the areas of all four walls and the ceiling to calculate the amount of paint or wallpaper you need to do the room. If you want to be really precise, compute the areas of the room's windows and doors; add them together, and subtract the sum from the total area of the walls and ceilings. You can do a one-time calculation of square feet by measuring from the outside, where interior walls don't block your way. Measure the house from end to end and side to side to discover how many square feet it is. A home that measures 65 feet long and 30 feet wide is a 1,950-square-foot house. Learn the total square feet of your house's lot in exactly the same way. A lot measuring 100 feet by 110 feet yields a generous living space of 11,000 square feet. Subtract the house area from that to see how many square feet of outside space you have: 11,000 minus 1,950 is 9,050 square feet -- a lot of sod to buy if you're planning a lawn. Not all building materials are sold by the square foot. For example, carpeting is often sold by the square yard. Of course, the simplest approach in this case is to measure and multiply in yards, instead of feet, to begin with. However, if you showed up at the store with all your measurements in square feet, you can quickly recompute by dividing your total square feet by 9 -- the number of square feet in a square yard. For example, if the floor space you want to carpet totals 500 square feet, 500 divided by 9 is 55.55 square yards. Likewise, if you have an awkward area that measures less than a foot in one of the dimensions, it can be multiplied out as square inches, then divided by 144 to get a figure in square feet. This is a handy approach when you're working with flat surfaces that are not an even number of feet, such as a table.